You would think that people stayed inside their warm, cozy homes during the cold Alaskan winter. Well, they do not. The more snow that falls or the colder it gets – the more galas and celebrations! The season kicks off right after New Year’s. They have hardly had time to clean up before the Fire and Ice Gala takes place. Then the Scots start their Robert Burns celebration. I guess you know at least one of this poet and composer’s songs; Auld Lang Syne. In addition to private celebrations, in which we also take part, they host a formal Haggis Bashers Ball and Burns Supper at the Sheraton hotel. I can promise you one thing: I’ve never seen so many men in skirts (Kilts, sorry) in my whole life. A great dinner loaded with Scottish bagpipes, traditions and pride. My husband and I were not familiar with the Scottish dances, but soon found out that the Norwegian Ski Pants Polka worked out great. Almost. Next event in line is the Anchorage Petroleum Wives Club with their annual gala. This year’s theme is the 1920’s After Hours at the Speakeasy, an evening of gangsters, flappers, fedoras and burly bouncers, so slip into your Charleston dress, drape the feather boa elegantly around your neck and kick your legs up high! 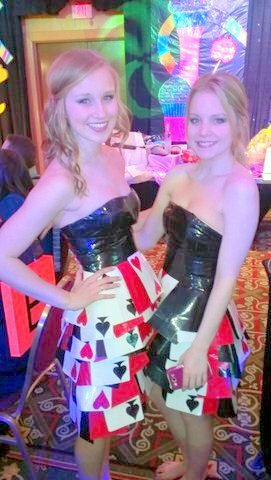 The next weekend is the Marine Gala, a fundraiser for Alaska SeaLife Center, a public aquarium who also rescues ocean wildlife, followed by the weirdest event I’ve ever been to: The Duct Tape Ball. A crazy ball with hundreds of people dressed in costumes made of gaffer tape in all the colors of the rainbow. The great thing is that all these events are fundraisers for selected charities. Then in March, the sled dog races Fur Rondy and Iditarod with Alaska’s Miners & Trappers Ball and several other festivities take place. When schools end in mid-May, there’s finally a chance to take a deep breath and relax before the visitor season starts. Alaska has a relatively short guest season, especially for those of us who go back home for the summer. We have a couple of weeks before and after our own vacation when we show our friends the real Alaska – but that’s another story (to be continued). A couple of weeks to recover after our summer house in Norway has felt like an “all inclusive hotel” for friends and family, and then it starts all over again. The first big event in the fall is the Mayor’s Charity Ball: Your night to shine on the red carpet, with dinner, live music and dancing throughout the evening, including live and silent auctions. This is an event that has transcended political lines for 20 years, helping others and making a difference in Anchorage. The following Saturday there’s a pirate pub crawl down town. Can you imagine my amazement my first fall in Anchorage, meeting hundreds of pirates swarming around whilst on my way to a jazz concert? The good thing is you don’t even have to get out of your costume, because the next party is Alaska Resource Education’s Pirate Party at the Bridge Restaurant down by the docks; a scary neighborhood, suitable for pirates with swords hanging in their belts. I was picked out to join the costume contest even though my costume was partly homemade. The one that got the most cheering from the audience would win. After four rounds, we were only two female pirates left. I decided do something extra to get the most applause and noise, so when my name was announced I just composed a Celtic inspired pirate twirl; and won! Yeah! Sometimes it feels good to be a little childish! Then we take a step back in time to the roaring twenties and the glamorous world of the Great Gatsby for The Bootlegger’s Ball at the Anchorage Museum. My husband dressed in his tuxedo with a glued-on mustache, fedora and walking stick. I was on his arm dressed in a fancy flapper dress, feather boa and with a peacock feather swaying proudly in my headband. When they announced that we could learn Charleston dances we joined in. 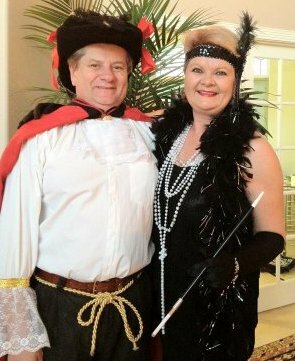 At Halloween we couldn’t agree on one theme, so one pirate and one flapper. Unfortunately we were standing in the back and could only see the blue satin shoes of the lady in front of us. Whatever she tried to do, we tried to do too… When the dance competition started we joined in, full of self-esteem but without much knowledge. I tried to remember the moves from my Zumba dance All That Jazz and my husband followed. Guess what; we even made it to the finals just by improvising. A great evening! At Halloween we were invited to three parties the same evening and we made all of them – phew! Then it’s time for Christmas parties. When you add business parties, conventions, private parties and dinners it sure adds up! As if this isn’t enough, Anchorage is ranked as the seventh “most restaurant-crazy city” in the US based on most restaurants per residents, with a population of 428,041 and 1012 restaurants. I guess this is only the tip of the iceberg, since this is just in our social circles. Oh, did I mention that we also go to theaters, shows and concerts? As you might know by now, living in Anchorage requires being in really good shape and health. I have not danced this much since high school. After two years in Alaska I might even get a phone call from Dancing with the Stars. Who knows? Heidi – what a great article!! Keep up the great work! Thank you Jocelyn. I will. Next chapter in Expat Tales will be The Great Race of Mercy, that saved 10.000 lives – so stay tuned!